This is one of those hodge podge posts with odds and ends and ends and odds. It’s a rare day that the restaurant is closed and I get to have the day to myself. Happy fourth to those who celebrate it. I am not sure we understand that much about the holiday anymore here in the U.S. As a matter of fact, I think Jefferson might raise a bemused eyebrow, were he able, at how this serious day in American history is remembered. For an entertaining look at today, please read the latest on Monkeyprodigy, my son Micah’s blog. 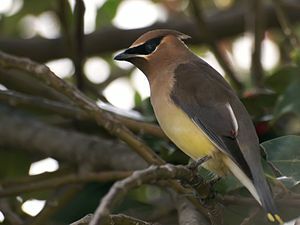 Afterward Micah, his mother and Brian and I got to see a summer flock of Cedar Waxwings in the park at what the locals call “Halfway Dam.” These little birds are amazingly beautiful! I think of them as a classier forest version of the more gaudy parrots of South America. Luckily I had the foresight to bring my binoculars so we could get a close up look. This is one of the things I love about birding, the whole world of beauty right under our noses, which we usually miss on a daily basis because we don’t pay close attention, until we are forced to by a bright flash flying past. So I told you in my last post about the reading Sunday at the Priestly Chapel. I was quite happy with how the whole morning went, and I admit, I was a bit nervous as it was the first long public reading I had done in years. I have been pretty quiet apart from this blog and an occasional YouTube post when it comes to my own work, but I am starting to submit again, and getting involved with a new local project to bring poetry and art some new life and attention here in my corner of Penn’s Woods. More on that project soon. I’ll be reading again with a bunch of fun local poets at Faustina’s Gallery in Lewisburg this Thursday for Poetry Under the Paintings. We will miss Steve Mitchell, but he is in California working on a movie about his music. I’m so happy for him! We may, it seems enjoy some acoustic accompaniment this week though. I’ll try to record it again. This reminds me, I need to ask Jody what it was she said about the Piano. Brian is such an amazing pianist, and he can hardly keep his hands off an instrument like that when it’s in the room. Maybe he could play as people arrive. . . if we get there early enough. In other recent news I have been asked to read with two awesome poets for Sunbury’s River Fest in August. Melanie Simms and Marjorie Maddox . I am very excited about this, as I am definitely the junior poet of this trio. I feel honored to participate and excited because it fits beautifully with the project I alluded to above. Look for a new YouTube video or three coming soon, along with some new writing, and the work of submitting poems, I feel a new series of vids coming on. 🙂 Okay, I have a few things to do before going to enjoy some sunshine and then fireworks. Have a great day! Look forward to reading with you! 🙂 Thanks for your kind comments! My pleasure. I hope you got my email response this afternoon, Melanie. I have no idea why I have been so busy lately. I should edit this post to say that Sunday was my first public reading in years that was of any length. 🙂 I’ve been reading with the Lewisburg poets at Faustina’s the last several months, and it’s been wonderful!